FILE - Members of the Islamic State militant group parade in the northern rebel-held Syrian city of Raqqa. Carter said if the U.S. finds additional groups willing to fight IS in Syria, he and President Barack Obama are prepared to deploy additional U.S. forces there. U.S. Defense Secretary Ash Carter said if the U.S. finds additional groups willing to fight Islamic State militants in Syria, he and President Barack Obama are prepared to deploy additional U.S. forces there. 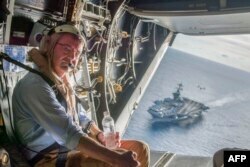 Carter, appearing Sunday on U.S. television while aboard the aircraft carrier USS Theodore Roosevelt in the South China Sea, said that as the U.S. learned in Iraq and Afghanistan, the key to victory is having local forces capable not only of winning but also keeping the peace. "Now, those are hard to find in Iraq and Syria. That’s why its going to take some time because we have to help develop, enable, encourage those forces," the defense chief said. Using an acronym for the group, he added that some forces "have shown some effectiveness in fighting ISIL and, if they grow in size, we’ll do more. If we find additional groups that are willing to fight ISIL, and they’re capable and are vetted, we’ll do more. The president has indicated a willingness to do more. I’m certainly prepared to recommend that he do more, but you need to have capable local forces." Carter said the number of U.S. troops involved is less important than their abilities. Secretary of Defense Ashton Carter flies in a V-22 Osprey after visiting the aircraft carrier USS Theodore Roosevelt, Nov. 5, 2015. "They have these unique skills to be able to call in airstrikes, to provide intelligence. So, they are force multipliers for a force that is much larger than 50, but is [composed of] local people," he said. Although U.S. military personnel are not deployed to take part in combat missions, Carter acknowledged that, as in the case of a U.S. Army master sergeant killed last month in a hostage rescue mission with Kurdish commandoes, they may find themselves forced to fight. "We’re sending them into a dangerous situation and it can develop into a combat situation, as it did with Joshua Wheeler," Carter said. "They’re sent there to support the local combat forces, but they can find themselves engaged as he did." Asked if the U.S. is going back to war in the region, the defense chief described the IS group as an evil that threatens American security. He said the group must and will be beaten. Appearing on a separate U.S. program Sunday, the vice chairman of the Senate Intelligence Committee, Senator Diane Feinstein, said the few dozen U.S. special operations forces being deployed are insufficient to the mission at hand. "If we’re really going to use special operations [forces], quick in and quick out, you’ve got to do it in a much more comprehensive way to get at ISIL. This isn’t just one facility, it’s not just one building in Raqqa or somewhere else, it’s many different places," she said. "Another thing that seems to be emerging is the belief that bombing alone isn’t going to do it," Feinstein said. "We’ve had over 7,000 sorties. Others have made sorties as well.... That hasn’t changed the dynamic." Meanwhile, Reuters reports that U.S.-led airstrikes against IS targets in both Syria and Iraq intensified in the eight days ending November 6, with nearly 60 after conducting just three in the previous eight days. On Friday, a Pentagon spokesman said simultaneous operations are pressuring IS fighters on multiple fronts. Feinstein suggested coordinating strategy with Russia to defeat the IS group in Syria. Congressman Peter King, a Republican member of the House Homeland Security Committee, has called for an "all-out" strategy to defeat the jihadist group and insisted U.S.-led coalition airstrikes have been ineffective. "I don’t think the president has done enough as far as having the forces on the ground that are necessary in order to make the air attacks effective," said King. Democratic Congressman Adam Schiff, the ranking member of the House Select Committee on Intelligence, told U.S. viewers Sunday that more needs to be done on the battlefield in Syria. He cautioned that the fight against the Islamic State group could take up to 20 years.